EVERCAST® Internet is a division of UE Corporation (UEC), incorporated in 1974. 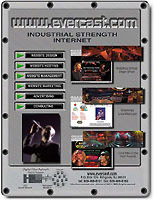 EVERCAST® provides a wide variety of commercial internet and new media marketing services. Located in rural Ringoes, New Jersey, EVERCAST® offices are about one hour southwest of New York City. For more information, please use our online request form.